Are you a Panther that's pink? It had to happen! There’s a quiz to gauge which Black Panther character fits your demenour. In fact there’s two, so you can get a second opinion. According to the Beeb’s quiz, I’m Killmonger. I wasn’t keen on the movie Erik but the quiz masters seem to find his good points. If there was a word to describe Erik Killmonger it would probably be “misunderstood”. You are extremely passionate about your beliefs and have a clear vision of what you think the world should be like, which can sometimes be intimidating for others. You have a strong personality and a remarkable abilty to win people over. You are always willing to stand up for what you believe is right even if it means you stand alone. QUIZ: Which Black Panther Character Are You? 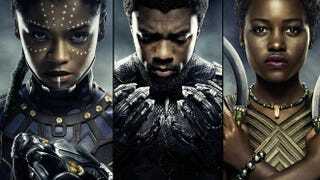 Would you be ruler of Wakanda, a highly skilled spy, or a trained fighter? And this time I’m Okoye. Okie-doke! You’re Okoye. You would make an incredible warrior. Your instincts are second to none and you’re always ready with a clever quip. So which Panther’s are you?